Thank you for...gosh, I guess four years of loyal patronage. 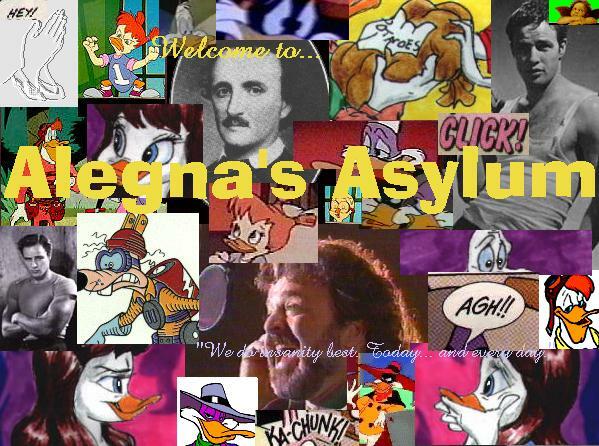 I have decided, after some deliberation, to remove Alegna's Asylum from the world wide web. It is simply wasting precious internet space that could otherwise be used for some greater good. That, and I really don't have time to continue maintaining it...and honestly I feel as though I have outgrown the page. Of course, I'll never outgrow my obsessions: Darkwing, Marlon, Jim. They will always be with me. But, as far as advertising them on an global medium such as the internet, well...I think the end has come. Thank you again to anyone who ever wrote me a kind email or signed my guestbook. It always felt great to get compliments on something I'd worked so hard on. Oh, and a special thanks to all the amazingly talented people I've met online--you know who you are! You've helped me with art, with html and with friendship, and you all truly rock. Keep the faith, my brothers & sisters! LONG LIVE DARKWING, MARLON, JIM, INTERNET FANDOMS AND ALL OTHER RELATED CHAOS! You are poor soul number to be institutionalized here since my counter reset itself in mid-June, 2000. This page was actually founded on June 11, 1998. Closed on November 26, 2002.